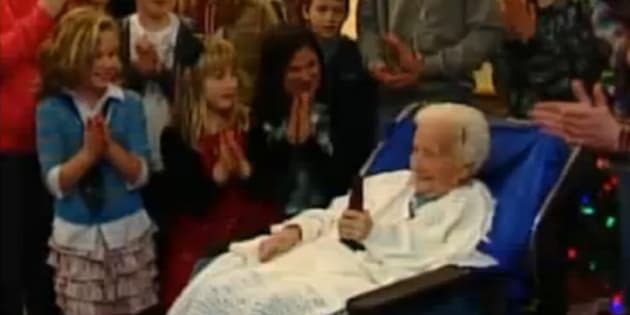 VICTORIA - Canada’s oldest person who was known for celebrating her birthday with a cold beer has died just one month and one day shy of her 114th birthday. "She said there’s nothing you can do about it," he said. "If you’re old, you’re old. And if you’re young, you’re young." Variations of her favourite piece of advice included, "Mind your own business and don’t worry about too much." Merle was born Dec. 23, 1900, in Des Moines, Iowa. Her father was a horse rancher and she moved to Abbey, Sask., in her teens. She met a ranch hand, Dewey Barwis, at a dance and they married in her parents’ parlour. Dewey got a job as a train station agent and the couple moved around Western Canada with their three children. Merle, who was often left alone with the kids, learned how to stretch a dollar. "I know sometimes she did without, so that we could have things," said her daughter Esther Gaff, 88, from Medicine Hat, Alta. In 1952, Merle and Dewey retired to Sooke, where their son lived. Dewey died in 1966 and Merle never remarried. Terry remembered waking up early Christmas mornings and seeing a light on at his grandmother’s house, which was on the same property. He and brother Richard spent the early morning there — Merle always had coffee on next to her bed — until their parents awoke. His daughter Tara, now 41, phoned Merle every day after school for a full report on the soap operas. "She called a spade a spade. But she was very loving — not in a mushy way, but hard loving. Like, 'I love you and that’s that,'" Tara said. Merle loved to bake, said her grandson Richard. But she also got a kick out of ordering cakes out of the Sears catalogue, Tara said. Merle took pleasure in the simple joys of life. In her 90s, Terry said, she liked cutting the grass. "She cut half the lawn, sat down and had a cold beer, then cut the other half after she finished her bottle," Terry said. She was pleased when she learned she was the oldest Canadian at age 112, Richard said. "She thought that was pretty good. I asked if she wanted the prime minister (Stephen Harper) to come, and she said, 'I don’t want anything to do with Trudeau,'" he said. Both of Merle’s parents lived into their 90s and she had a sister who lived to be over 100. Merle outlived her two sons and two of her 10 grandchildren. She had 17 great grandchildren. Alexander Imich attributed the long length of his life to good genes and a healthy lifestyle, having quit smoking and drinking long ago. Imich was just one of several Americans who have been recognized as the oldest people in the world. However, the U.S. is not known for having the oldest population in the world in general. According to a 2011 study by Euromonitor, all of the countries with the oldest populations are situated in Europe, with the exception of Japan. The United States, however, might soon join its European and Japanese counterparts, as the Administration of Aging expects the percentage of Americans older than 65 to reach 19 percent by 2030. The oldest person ever recorded was French citizen Jeanne Louise Calment, who reached a whopping age of 122 years and 164 days. Born in 1875, Calment witnessed both the technological innovations and the destructive wars of the 20th century before passing away in 1997 in her hometown of Arles, France. Despite having been the home of the oldest person in the world, France, just like the U.S., is not known as one of the countries with the world's oldest population. According to the United Nations, the French elderly population grew from 7 percent to 14 percent in 115 years. In contrast, it will only take developing nations China and Brazil twenty-something years to experience the same change in demographics. When Jiroeman Kimura died in June 2012 at the age of 116, he had been the oldest man for just around six months. Japan is accustomed to a large elderly community. In January 2011, more than a fifth of Japanese were older than 65 and the average life expectancy stood at 83.1 years. Yet Japan's long lifecycle will likely create headaches for its lawmakers, who face the world's second-largest public debt and a below-replacement birthrate, making it difficult to continue handing out generous pension plans to a retiring workforce. At age 117, Italian Emma Morano was the oldest person currently living in the European continent. Morano said a good night's sleep contributed to her long life: She went to bed before 7 p.m. and got up before 6 a.m. She also ate one raw egg per day. Italy was recently ranked fourth in its percentage of citizens that are over 65 years old. Like Japan and other nations whose populations are aging, the Mediterranean country faces the challenges that come with a declining workforce. According to CNBC, the Italian population aged 0-14 hasn't grown since 1999, exacerbating the fact that only 37.4 percent of 55-64 year olds still work. When Ecuadorean Maria Capovilla died in 2006 at the age of 116, she was recognized as the oldest woman to have lived in Latin America and in a developing nation. Capovilla's daughter told the Los Angeles Times that her mother "always had a very tranquil character...She does not get upset by anything. She has been that way her whole life." Capovilla's impressive lifespan highlights the growing concern of other Latin American countries -- particularly Brazil, Mexico, and Chile -- whose aging populations will put burdens on government finances. A report from the Center for Strategic and International Studies estimates that "the number of elderly in Latin America will triple as a share of the population by 2050," resulting in a "dramatic slowdown in population growth." Another concern for the continent is that while life expectancy has increased, living standards in many Latin American countries have stagnated. CSIS warns that "while the United States, Europe, and Japan all became affluent societies before they became aging societies, Latin America may grow old before it grows rich."